New SaltStack Silicon Valley user group delivers hands-on labs and expert presentations on automation for webscale application environments. LinkedIn engineers will share how SaltStack is utilized to build the next-generation LinkedIn data, storage, and search platforms through automation for web-scale DevOps teams. 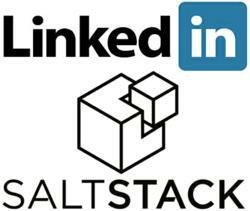 SaltStack, the full systems and configuration management stack for any cloud, today announced the first meeting of its Silicon Valley user group will be held at LinkedIn on Monday, June 17 at 5 pm. Join us by registering at http://devopsatscale.eventbrite.com/. LinkedIn Engineering and SaltStack will host an afternoon of hands-on labs, presentations, panel discussions and food. Thomas Hatch, Linkedin founder and CTO, will provide instruction on using SaltStack for more than just configuration management. LinkedIn engineers will share how SaltStack is utilized to build the next-generation LinkedIn data, storage, and search platforms with automation for monitoring, deployment, testing, and internal workflow for development, QA, operations, and release control in a large scale, mission-critical production environment. More details can be found on the LinkedIn Engineering blog. 5:00 - 6:00pm - Registration, food, networking. 6:00 - 6:45pm - Thomas Hatch presents, "Beyond Configuration Management - Systems State and Flow...Better Together"
7:00 - 7:45pm - LinkedIn Engineering and SaltStack presentations, "SaltStack and systems automation at LinkedIn"
8:00 - 9:00pm - Desserts, drinks, networking. Next week, SaltStack executives and engineers will also be in San Francisco and Mountain View, Calif. supporting the following events. Please join us for GigaOm Structure LaunchPad and DevOpsDays Mountain View. For SaltStack users in the city, the more-established SaltStack San Francisco user group can be found at http://www.meetup.com/Salt-Stack-DevOps/.